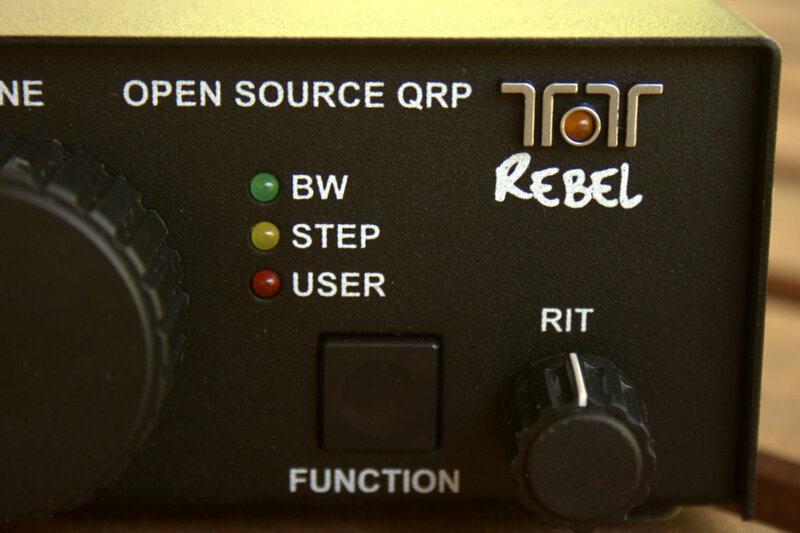 Today, at the QRP ARCI convention–Four Days In May–TEN-TEC will announce a new QRP transceiver based upon a completely different platform than any others rigs they have in production: a QRP radio, built on the chipKIT™ Uno32™ (Arduino-based software) to be known as the Model 506 Rebel. And, folks, I’ve been lucky enough to get my mitts on a prototype…! 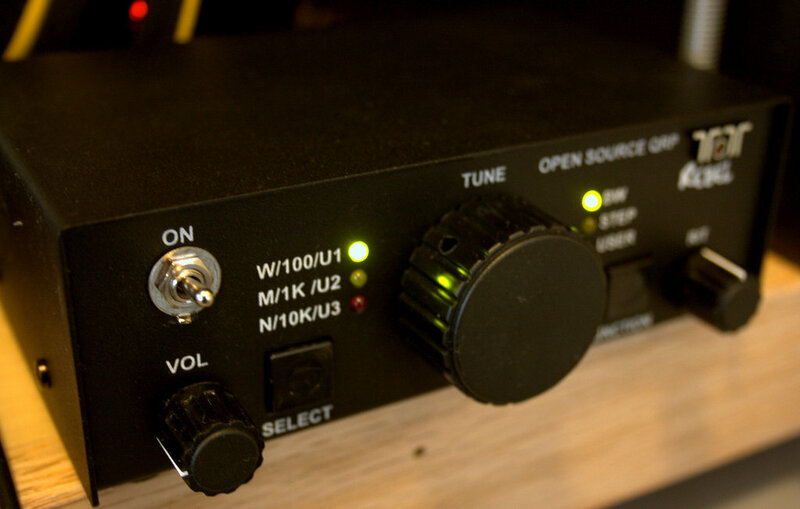 And I have to admit, I love the concept: TEN-TEC delivers a factory-built, uber-simple transceiver, with just enough programming to reliably get you on the air with a basic radio (see details below). Users then have full access to develop and program the Rebel via an open-source platform, themselves. No need to wait on firmware revisions; firmware, in a sense, will be crowd-sourced! That’s to say, it uses online collaboration–a great idea. According to TEN-TEC, the programming environment is very safe. Users can tinker with code without fear that they might harm their Rebel 506. The original base program can be re-flashed to the radio at any time. So if you can’t get past an error, you can always revert to a safe default copy. In addition, even if you don’t have any idea how to program, someone has already created a web-based email group where users can upload and share code packages, and you can select someone else’s programming to test drive. Click here to join the group. 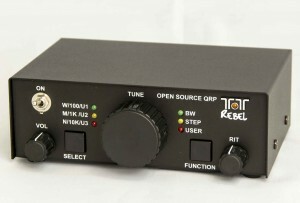 The Rebel is a CW-only transceiver that operates on 40 or 20 meters. The user changes bands by moving jumpers inside the chassis, mounted on the PC board. The basic Rebel comes with no frequency display. 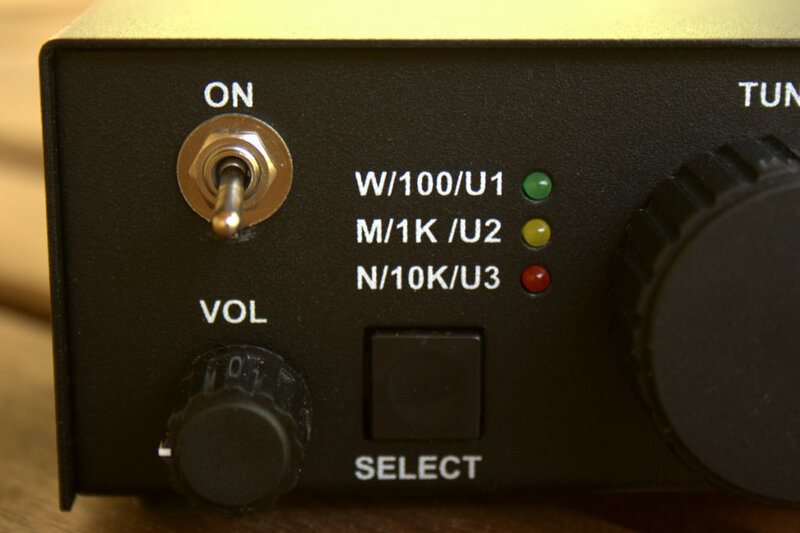 When you turn on the radio, it comes up on the QRP calling frequency of 7.030 MHz or 14.060 MHz, depending on which band is selected. There is no VFO, but a DDS chip that is highly stable and that allows the Chip Kit Uno 32 to select a frequency upon which to operate. Of course, since the Chip Kit controls the DDS chip, you can re-program how the Rebel manages frequencies. Last week, TEN-TEC sent me a prototype of the Rebel to Beta test. I’ve had it on the air several times–I’ve also popped the cover and given it a thorough inspection and workout. I’ll share my initial impressions below. I’m not commenting, however, on some specs like filtering, as they have not been finalized for production and are still subject to change. The unit I tested, keep in mind, was a prototype; production units will be still more polished and incorporate changes Beta testers have provided. 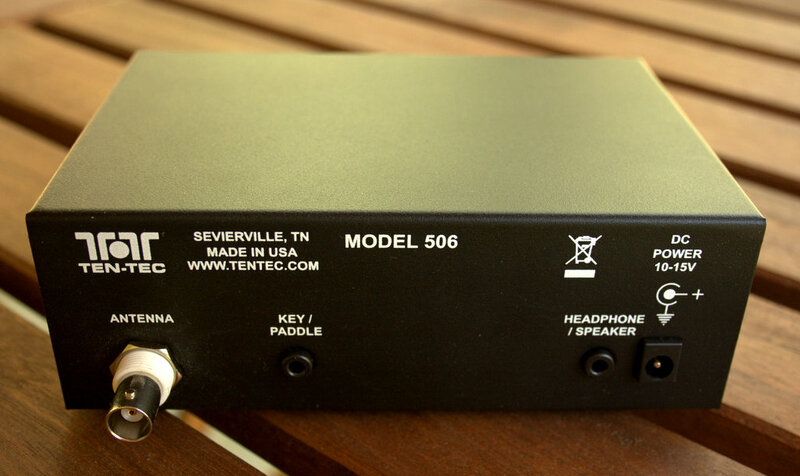 The front faceplate of the Rebel 506 is reminiscent of TEN-TEC QRP Kits, gloriously clean and simple. There is a large tuning knob in the middle with a SELECT button on the left and FUNCTION button on the right. Both buttons are large enough that you could comfortably use them even if wearing winter gloves. Above each button is a vertical row of just three LEDs: green, yellow and red. These colored LEDs simply indicate the position of the function/selection buttons. 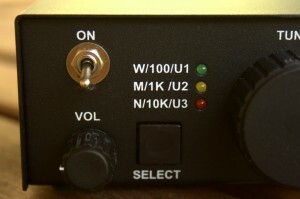 There are only two knobs: one for volume (AF gain) and one for RIT (+/- 500 Hz). There is also an ON/OFF simple toggle switch, and a rather classy touch from TEN-TEC–namely, a small LED light in the TEN-TEC logo itself. And that’s all, folks–bare-bones design. As you tune within the selected tuning steps, the LED in the TEN-TEC logo flashes as you pass each step; for example, if you’ve selected 100 Hz steps, then when you pass each 100 Hz step, the LED in the logo will flash once. When you reach either band edge, the LED stays lit. Again, a nice touch. When you turn on the (factory default) Rebel, the frequency starts on QRP calling frequencies 7.030 MHz (40M) or 14.060 MHz (20M)–of course, you could change these with programming. There are (already) third-party frequency displays that plug into the Rebel’s board, an easy addition. Since I had neither frequency display nor frequency counter, I simply used my SDR’s waterfall display to locate where I was on the band. It’s also fairly easy to count the steps with the logo’s red LED. On the rear panel, you’ll find a standard BNC antenna connection, a key/paddle port (1/8″), a speaker/headphone port (1/8″) and a standard DC port (10-15V reverse polarity protected) that equates to 4-5 watts output depending on supply voltage. Key/Paddle input from the factory is only for straight key, but you can modify the code to make it a paddle input. Also, the headphone/speaker port defaults to headphone use from the factory, but there is a small jumper on the PCB that can me moved to drive a non-amplified speaker. 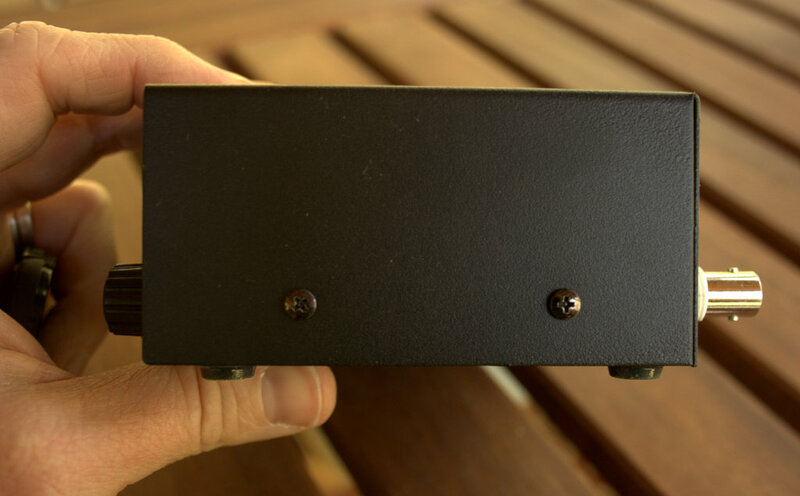 On production units (not on my prototype, however, nor on those at FDIM) there will be a CW side tone volume control pot via a small hole in the side of the Rebel’s enclosure. Also, production units will have a hole on the rear panel to allow for access to the ChipKit’s USB port. Battery read pin: reads 0.20 of the supply voltage. 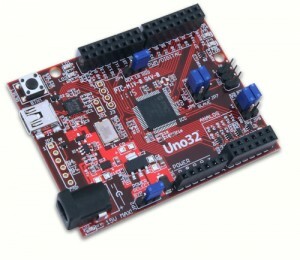 All connections of the Chip Kit Uno32 are available on the top of the PCB. Evidently, the Rebel has a lot of memory space for writing CW memory-keyer functions or whatever the user desires/dreams up. Even a voice synthesizer could be installed in the Rebel; indeed, I believe there are many mods and possibilities for the Rebel. The greatest limitation might simply be…the imagination of the user. I have thoroughly enjoyed putting this little radio on the air. Let’s be clear, though: this is no Argonaut VI or Eagle, nor should it be expected to be. Receiver performance is on par with other QRP kits and rigs of its class. The Rebel is fairly sensitive and the noise floor is fairly low. Selectivity is adequate for most conditions, although I imagine crowded conditions could overwhelm this modest receiver. When I had the Rebel on the air, I engaged in a bit of a rag-chew and found the audio quite pleasant from my GoalZero portable amplified speaker. And other than needing to adjust the side tone volume, the Rebel was ready to go, straight out of the box. Criticisms? Well, it’s just too early to have many. I’ve passed along all my frank observations to TEN-TEC and they’re actually addressing them now (yet again, one of the many benefits of an American-based radio producer). If this were a $900 rig, performance-wise, I would complain about selectivity. But I’m willing to bet it’s at least as good as the Index Labs QRP ++ I once owned. In fact, though it’s not a full-featured general-coverage rig, it has that same sort of bare-boned fun factor the Index Labs radio provided me, along with many other QRP kits. Field? I would totally take the Rebel into the field or backpacking. I have a hunch it uses less than 200 milliamps on receive. It’s modestly-sized and built like a little tank. Here is the amazing part about the Rebel: TEN-TEC only shipped me the radio–no connectors, no adapters, no power cord. At first, I thought I’d have to find an appropriate plug and solder my own power cord, not to mention figure out what other adapters I would need for my key/speaker…but I didn’t. The power port is very standard; the same one my LDG ATU, Elecraft K2 and KX1 use, with standard positive tip polarity. The Rebel’s antenna connector is a BNC, speaker and key ports are standard 1/8″ and the ChipKit board has a mini USB connection. The top cover is easy to remove–even the toggle switch, LEDs and selection buttons are all standard and easy to access for servicing. Everything is standard! But it doesn’t stop there. The Rebel is truly an experimenter’s radio, and is meant to be. The programming is completely open-source and TEN-TEC is encouraging and facilitating users to tinker with the code and make hardware modifications at will. Open-source technology is all about alteration and collaboration, the kind of environment we hams have always embraced. In the open-source world, nothing is proprietary; rather, everything is transparent, standard, accessible; supporting changes and modifications of every stripe. And in my humble opinion, it’s about fun. On these points, the Rebel delivers. I have done some scripting in my past, but I am no professional programmer. Though many of my Maker friends had been urging me to give it a go, I hadn’t jumped on the Arduino band wagon until, well, now. 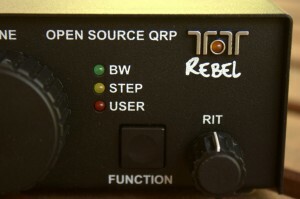 The Rebel will serve both as a great intro to Arduino Compatible Code and a truly fun QRP rig. If TEN-TEC is lucky, this little rig may actually nudge some of my Maker friends to get their ham radio tickets. UPDATE: Pricing for the Rebel is $199 US. By the way, if you’re at FDIM or the Hamvention this year, drop by booth 411 in the Ball Arena: I’d be happy to talk with you about the Rebel further (and my radio-based non-profit, Ears To Our World). Disclaimer: Just to be clear, although I own TEN-TEC (also Elecraft and Yaesu) products, and although I Beta test for TEN-TEC on occasion, I have no formal relationship with TEN-TEC. Nor am I compensated by the company in any way. The opinions in this article and others on this site are frank and my own; they are not those of TEN-TEC. This entry was posted in Announcements, Product Announcements, QRP, QRP Radios and tagged Arduino, Arduino Ham Radio, Arduino QRP, Ten-Tec, Ten-Tec Arduino, Ten-Tec Model 506, Ten-Tec Model 506 Rebel 506. Bookmark the permalink. Very cool, Thomas. I think I just found my next new rig. Very cool! I’ve been off of the air for too long — this rig tempts me mightily! 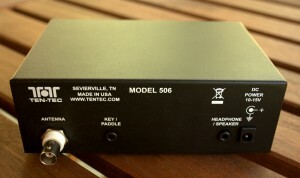 The 506 price is $199.00 + shipping and appropriate taxes. No options yet. We are ordering final production boards this week. It just so happened to coincide with Dayton so we were able to use Dayton as a final benchmark. Should get boards in 3-4 weeks, build, testing, manual writing, intro literature, etc., we estimate shipping in July. Can’t get more accurate than that right now. Thanks for the reminder! I’ll update the post with pricing. Just now getting my wits back after the Hamvention. Thanks for bringing this product to my attention: seems very cool, and at a reasonable price point. I am somewhat surprised that they didn’t include some form of display with the kit: it wouldn’t have added a great deal of cost, and would have added flexibility and ease of use. The idea of using a DDS to allow you to set precise frequencies under digital control, but then not communicating those to the user seems just…. bizarre. Nevertheless, seems pretty cool, I’ll have to look into it more. Pingback: PA3ANG – Dutch Ham Radio Station – Homepage & Weblog » De Rebel is besteld! if it is open source, where is the source code of the firmware ? which terms of license were used for the firmware ?